just that I was thrilled my stalks had ears of corn growing on them. 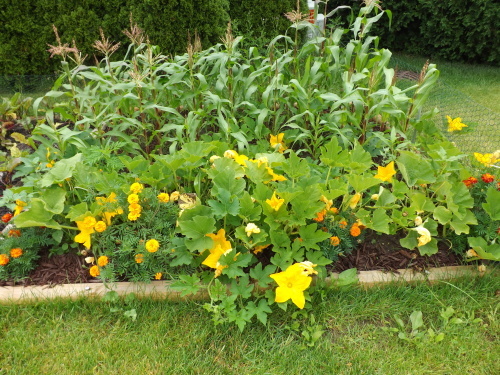 but attributed this to the fact that corn drains all the minerals from the soil and seeing as I hadn’t planted the corn in compost or manure, their stunted growth was not something I could really do anything about. Even so, the ears of corn continued to grow, albeit a bit smaller than what we were used to seeing at the farmer’s markets. Then came August and Hubby asked me how the corn was doing. I told him I thought it was fine, but really had no idea how to tell if it was ready. We headed out to the garden and pulled a few ears off the stalks and they were beautiful. Thrilled that the corn appeared to be ready, I put them in the microwave, as this is our preferred method of cooking corn on the cob, and cooked it for 5 minutes. After turning it, and cooking for an additional 3 minutes, it was time to taste our first ever home-grown corn. It was not at all what I expected. Although sweet, it was chewy, almost gummy. I was devastated. What had I done wrong? Why was it so awful? Hubby choked it down, unsuccessfully trying to convince me that it wasn’t “that bad.” Gotta love him. Once I’d cleaned up the dinner dishes, I went straight to the computer to find out what had happened. Well, turns out that there is apparently a very small window of opportunity for picking corn and if you miss that window, the corn gets old and chewy right there on the stalk. Go figure. I had no idea it was temperamental or that waiting too long would ruin an entire crop. 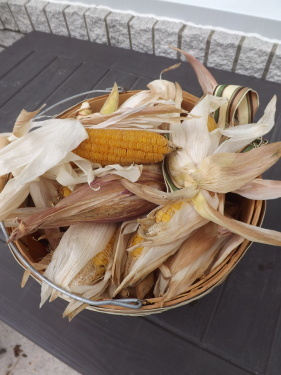 Not wanting to waste the corn I had, I researched other ways to use corn, especially old, over-ripe corn. 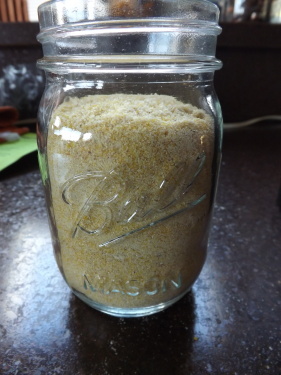 What I found was the perfect solution — homemade cornmeal. Seeing as I had left the corn on the stalks all through July and August, leaving it on another month or so surely wouldn’t hurt. This way the corn would dry enough for me to harvest it and jar it for grinding into cornmeal at a later time. Which is exactly what I did. 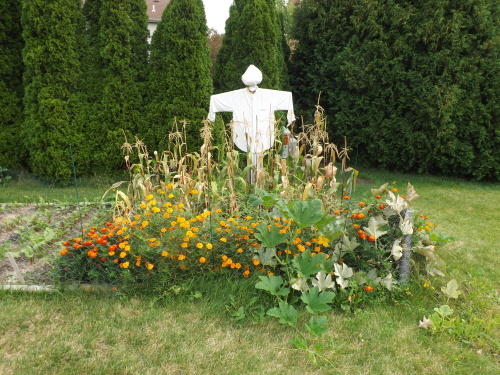 I harvested the corn in late September. 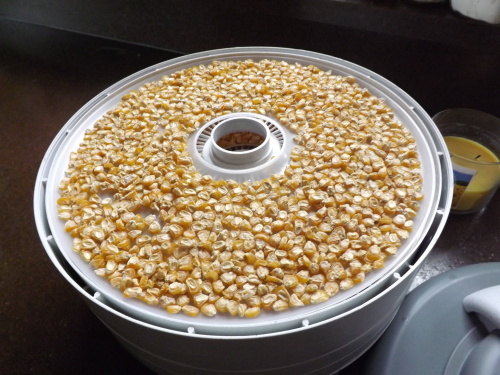 To be sure that the corn was dry enough though, I decided to let it sit in my dehydrater overnight. 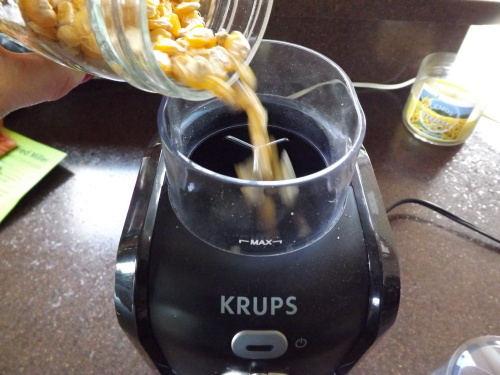 Once dry, I jarred it until ready to put through my coffee mill. 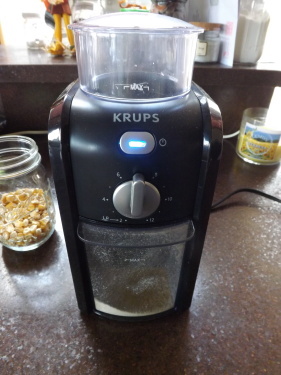 A coffee mill is the best way to grind corn or any dried vegetable for that matter. 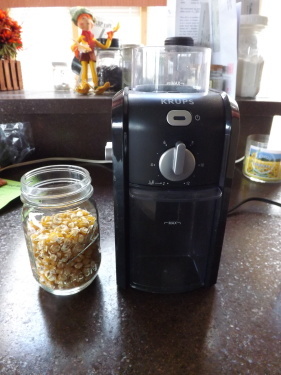 First add the corn to the coffee mill. Then on a medium setting, grind the corn into a fairly fine meal. Return the meal to the coffee mill and run it through again on the finest setting. And Viola! 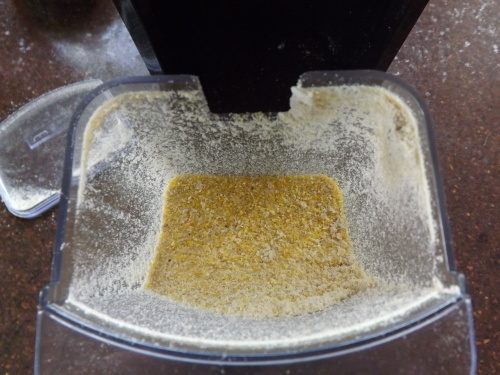 fresh homegrown cornmeal. Half a pint of kernels yielded nearly a full pint of cornmeal. What could have been a complete loss, turned out to be a great mistake. Hubby loves cornbread and we all love cornmeal crusted pork or chicken. I had never thought about making my own cornmeal until this happened, but tell you what, I’ll never think about buying it again. Next year I plan on planting twice as much corn as I did this year. 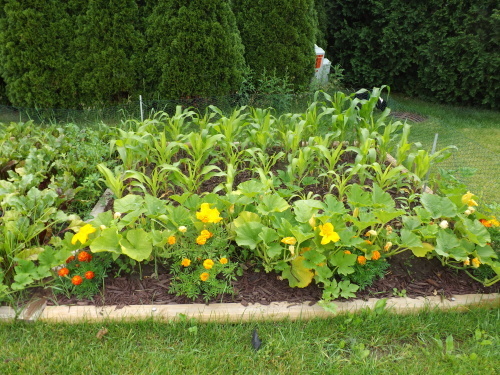 It will be planted in compost or manure and we will harvest it as soon as the ears of corn feel full. I’ll test it often until it is perfect. 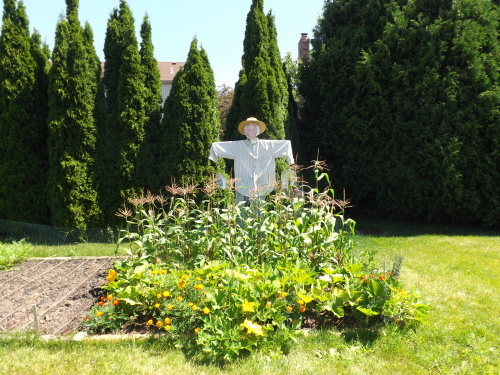 Then, when we’ve eaten to our hearts content and I’ve frozen what we’ll eat through the winter, I will leave the corn on the stalks until they are dry and harvest them for cornmeal. Nothing goes to waste, and for this I am — Simply Grateful. 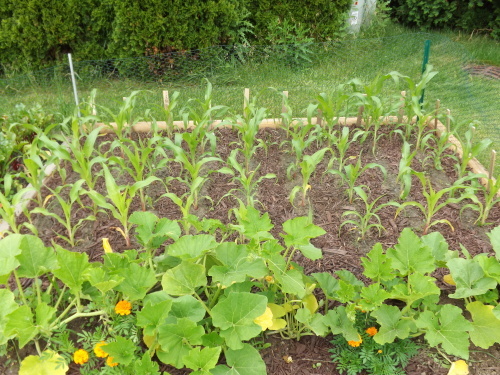 Categories: Corn | Tags: Corn, Gardening, Homemade Cornmeal, Over-Ripe Corn, Uses for Over-ripe Corn, When to Pick Corn | Permalink. Great idea. I have a large bag of dried corn in the drawer. I use it now and then in soups. I love that idea of grinding it up, that might happen here soon. Thanks!! Sometimes when we are brave, we find good things.